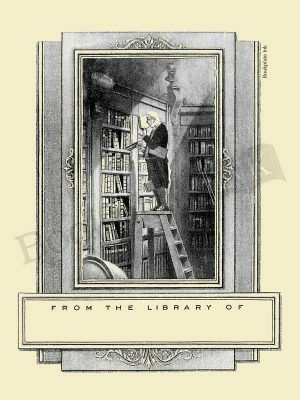 One of our most popular designs, this adaptation of German Romanticist painter/poet Carl Spitzweg’s famous satirical painting “The Bookworm” was originally published by the Etchcraft Company. It was introduced by the Antioch Bookplate Company in the 1950s. It is also available without personalization in the Non-Personalized category.